It seems to me that a post featuring a garment that is not only available on-line, but heavily discounted is sort of like a public service announcement, no? This Marissa Webb jacket is available on Intermix for $130, marked down from its original retail price of $695. For those of you who do not excel in mathematics, note that the current price is listed as $259, but that a 50% discount applies in the shopping cart. Also note that this price is FINAL SALE. 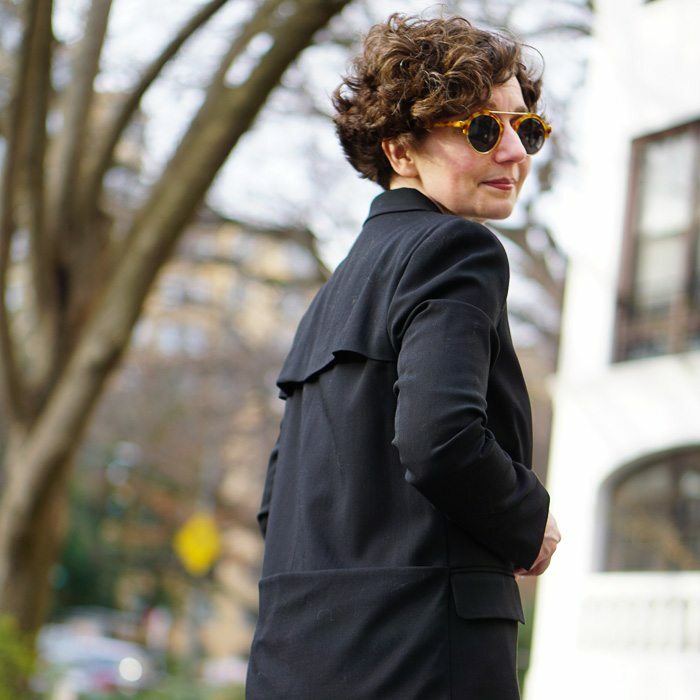 This jacket is a bit of a departure for me: long, unstructured, and loose. While I’ll never give up my little jackets, one doesn’t want to look in one’s closet and see nothing but sameness. I think this loose, long jacket is just the sort of thing for casual Friday and the weekends. In fact, I went out for a late afternoon movie and dinner with my photographer this weekend and wore this very outfit. In the photos above, you can see that the jacket draws some inspiration from a tuxedo jacket. A side view reveals additional elements. The back is longer than the front, and squared off; like a tennis shirt. A wide band — a sort of abstract belt — runs across the back, and lines up the with the hem of the front. And there is a vented yoke across the shoulders that looks like trench coat styling. Certainly an eclectic set of details, charmingly (in my opinion) combined. 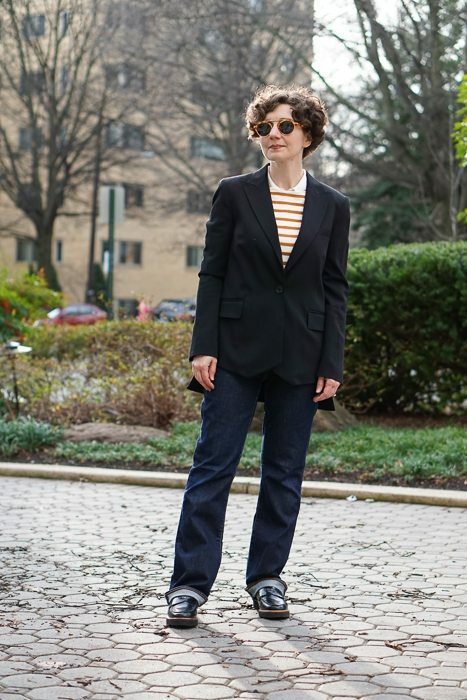 The fabric is a wool/synthetic mix that feels like a fine gabardine (I guess it is a fine gabardine) and is very comfortable. Tail is straight, but appears to flare a little; is that an effect of the wind, or my rump . . . NOTE: Since the jacket is a FINAL SALE item, it might help you to know my size. I am 5’3″ and wearing a SMALL, which fits perfectly. Very unusual, that. Outfit is very fetching on you Directrice! I like seeing you in something so boyish. And I do appreciate the public service announcement. I was actually very tempted to order the jacket myself until I saw the back. Oh my God, what a disaster! To my mind, that is the reason this jacket is on sale. Hot. Mess! But from the front, the look is delightful. So sayeth Desh. Desh! If you never listen to another thing I say, hear me now. (Hear me now and listen to me later!) 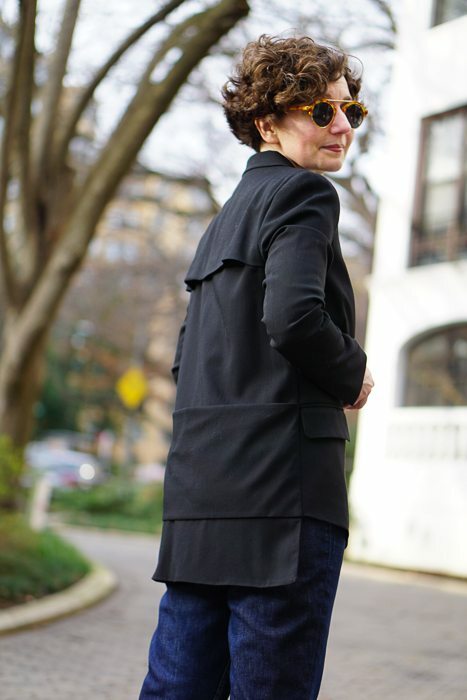 This jacket is perfect for your tall, elegant self; the back is incoherent but charming. That extra length in the back really works. Order size L if you want it loose and slouchy, because it runs small. Like Desh, I love the jacket from the front, and the vented yoke in the back is nice touch. Not a fan of the “tail”. The wide “belt” gaps at the top in your side view, and might also call attention to an area in the back that some us who are not as svelte would like to avoid. Continuing my spirited defense of the jacket, removing the belt would be an easy and inexpensive alteration. Susan points out another important flaw in this deeply discounted garment: the wide belt gaps at the top. Unlike the Directrice, I am not charmed by the “incoherence” of the “tail.” (for those of you who are not personally acquainted with the Directrice, I will let you in on a Fun Fact: she is capable of being amused by almost anything.) I do like the fact, however, that this jacket is capable of hiding the most bulgy of bottoms. That, I admit, is a plus. The longer back is quite appealing. The “belt” looks almost like a pocket – thus it could pass as utilitarian… and give you the ability to smuggle things… or house an object that provides lower back support when sitting. I’m into it. Ha! I’d been thinking it would be a place to put reading materials (magazines, Kindle), but I like your idea better. Lumbar support . . . or how about a hot water bottle? I hope you get a commission, because I just bought the jacket. I find it charming and it comes vetted by the Directice herself! What more could one ask for? By the way, you look equal parts chic and adorable especially with those cool sunglasses. You’ll have to let me know what you think when the jacket arrives. (I really hope you like it.) No commissions for The Directrice; the “income” from this site is purely psychic and comes in the form of reader comments and visits. I appreciate yours very much! Unlike Desh and Susan, I found the front view rather non-descript, and loved the structural play on the back of the jacket. I can see the attraction for you, particularly as an option for casual Friday, or to dress up a casual weekend outfit. I love that I am now viewing the structure of a garment much more deliberately when considering purchases, though pickings are less when thrifting, than purchasing new. Hello Cathi — Expertise makes things more interesting, doesn’t it? You strike me as someone who already had a high level of knowledge about clothing, but I am so glad that you are picking up new ideas. Happy New Year! My vision for this lovely jacket would be to wear it over a singular-color or minuscule-patterned, non-belted, no waistline dress (carrying on with the hyphens here!). But simplicity in the front would accentuate the intricate structure of the jacket from all angles! Yes – No – Maybe???? Thanks for a wonderful year of posts! Happy New Year! I think that’s a yes, CND! I love the jacket SO much. Thank you, thank you! I feel very cool and chic in it. The little floppy tails that can be seen from the front and the w-i-d-e belt in the back are even more charming in person. It fits perfectly. You have a special ability to see the potential in garments. If I had seen this jacket online I would have gone right by it. It did not look that special to my eye.